Four weeks and three days ago, my twins showed each other how to bite their binkies in half. Four weeks and two days ago, I broke my twins of their binkies. Result: Crying for only one hour; sleeping through the night; asking casually for binkies once in a while. Four weeks and one day ago, my twins breached their cribs. 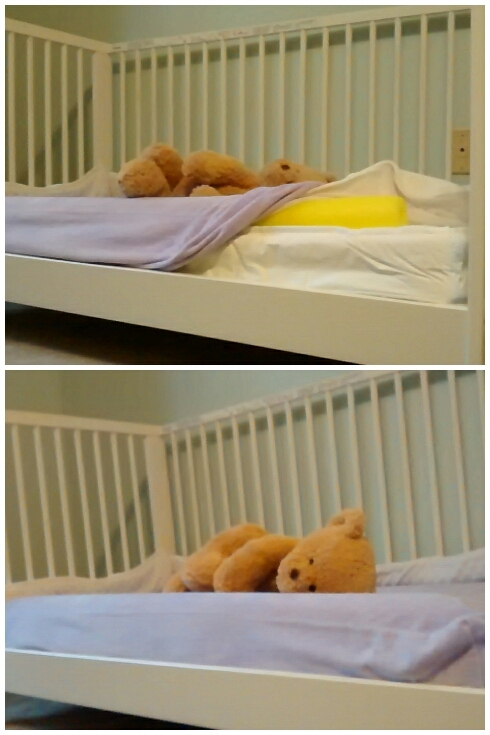 Four weeks exactly ago, we turned their cribs into toddler beds. Life as I knew it ended a month ago. As a “triplet” mom, I have a stranglehold on my kids’ schedules. Like most every mom, I only survive the day because I know I have nap time to recharge – mentally and physically. However, my job is a little more physically demanding than moms of singletons. As a result, I usually collapse in a heap as soon as I throw everyone in their bed/cribs and am too tired to even lift the remote. How would I fare if my twins quit napping?! With the twins’ trick of turning the binky into a perfectly-esophagus-shaped choking nightmare, a fireball of change was unleashed on my head. Only now, after our resolution, can I even begin to write about this ridiculous endeavor. For four weeks and three days, I was held hostage by this fireball of change. I was sleep-deprived and sanity-deprived. (Oh, yeah, so were the kids, but let’s be honest: I am talking about myself today.) I didn’t sleep at night and I didn’t recharge at naptime. After sleeping with my eyes open for a while, the twins finally started sleeping through the night again. It took a lot of sleep re-training, a lot of pitch-blackness, and also a couple of pool noodles. Yep. And as for the pool noodles? Well, if you can’t afford the bed rails to keep your twins from falling out of bed at night, learn from the Master: take a saw to a one dollar pool noodle, and shove them under the sheets. (Just don’t let your kids see you changing the sheets, lest they think bedtime equates with beach fun.) They haven’t rolled out since. They were happily sleeping a solid 2.5 hours each until the day they bit their binkies apart, so it was obvious that they still need nap. 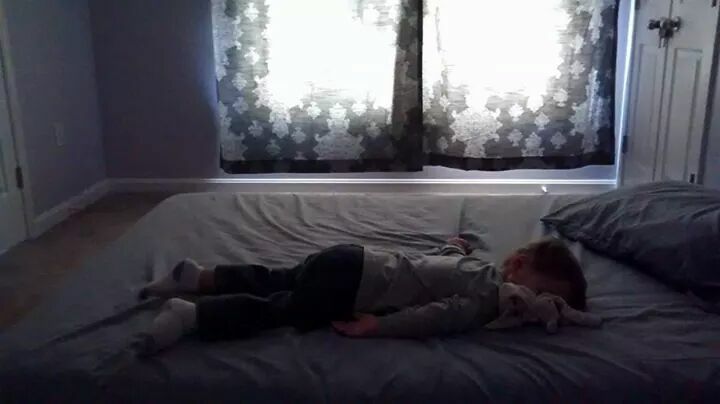 My oldest son quit napping long before he turned two and he was just fine, but I kept putting him in his room for quiet time. This ain’t my first rodeo. My Hurricane Boy, Twin B, does not know the meaning of “quiet time”. Even after our major childproofing, he broke the blinds, he removed wooden shelves from the wall-anchored bookcase and used them as weapons, and he broke a childproofing lock on his dresser drawer and then broke the drawer off the hinges. He is my tiniest boy, the one from the NICU, and he acts like the Hulk (only without the anger). My twins were taking turns torturing each other. The wails of pain kept me running up the stairs constantly. I would find a new bite mark, a book (or wooden shelf) to the forehead, or a sad boy sobbing, “Brother no hit! Night night all done!! !” It was horrible, and it never got better. My twins were keeping each other awake, but would sleep well* if separated. Never, and I mean never, would the Hulk sleep for me in his own bed. How do you think this makes a momma feel? I used everything I had. I stepped back and dug deep into my poor swiss-cheese-holed brain to access my education training, my developmental psychology training, and even my church teachings. I prayed. I sobbed. I felt like a failure. I greeted my poor husband at the door with Crazy Eyes and Crazy Hair. Nothing worked on that Twin B. It was like newborn days all over again. I had no control, chaos reigned, and I had no.idea.what.I.was.doing. Kids were cranky and sleep-deprived. But momma was more cranky and sleep-deprived. I couldn’t write or blog, because naptime was gone and my early mornings were NOT spent getting up with my husband at 4:30 AM. My brain became an anxiety-ridden tangled web, where nothing went in or came out. My ideas got log-jammed. My wires got crossed. Writing helps me organize my thoughts. Without it, I was a wreck. This weekend, we decided enough was enough. It is clear that I can’t fix this problem. I can’t make Twin B sleep without his crib, even though everyone else can. My mailman probably can. My dog probably can. I just can’t. He feeds off my anxiety that seeps out of my pores like fuel. My husband has the magic touch for both me and Twin B. Bless my husband: he never blamed me or shamed me about my inability to handle that kid. (He teased me a little bit…) We figured four weeks was enough time to know that Twin B was not going to adapt to this level of freedom – at least not in a way that I needed. Twin B got Plan B. We completely emptied out the guest room (which was formerly the nursery). We made a couple trips to Lowe’s and Babies R’ Us. We didn’t childproof that room: we Twin-B-proofed that room. We simply took everything out, locked it down, and left a mattress on the floor. Mr. Okayest helped him get used to his new nap room, and that’s that. The twins are separated for nap. They still sleep together at night. This is totally a first-world problem. Woe is me! I have an extra room on hand in which to put my kid! I have noise machines to drown out the other kids! I have each child in his own room! I live in the woods, where it’s so dark! I am relaxing with a blog! I know, I know, it sounds ridiculous to any mother from any other country, or any other socio-economic status, or any other time period in history. Shut up, Okayest Mom, and be glad you’re not all sharing one little mat on the floor in one little room. I know. Now I can breathe. I can rest. I can relax. I can write. The world is back to normal…. At least until the next fireball of change comes. PS, Yes, I am totally aware that if I had abided by the Montessori method of putting my newborns on a mattress on the floor from the start, instead of in crib jail, that this whole fireball of change would have been prevented. I made my bed, and then I had to lie in it. Only I didn’t get to lie or lay or anything… oh, you know what I mean….